Please inform your networks of the following article re the animal cruelty of Judge Gorsuch. 1. 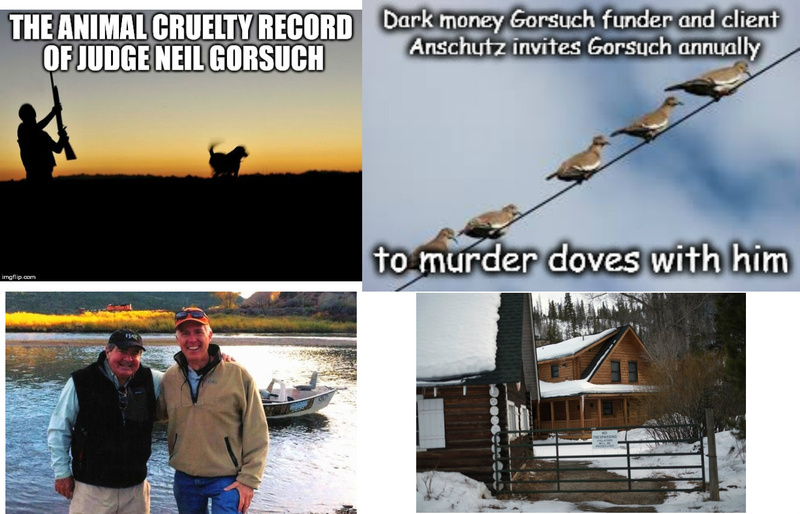 Every year, Gorsuch has hunted for doves with his billionaire client and one funder of his dark money campaign, Philip Anschutz. They are with others co-owners of a hunting lodge in Cranby Colorado. 2. Gorsuch went hunting with his fellow serially killing judicial executioner Antonin Scalia. 3. Gorsuch enjoys fishing, a blood sport in which the victims die of suffocation, smashing, eyes, throats or gills ripped out by hooks etc. 4. Gorsuch said in congressional hearings that he frequently took his law clerks to witness cattle drives, in which cowboys with everything from whips to shocking rods force voiceless mammals to feedlots or slaughterhouses. and animals killed, calves choked to death by ropes, calves and bulls have had their necks or legs broken. 6. Gorsuch has participated in the objectivist term 'muttonbusting' (referring to sheep by the name for their murdered flesh) in which both sheep and children are victims as toddlers are tied to sheep. 7. Gorsuch has written decisions indicating that slaughterhouse corporations or any other corporations have the same right as people.
. His lack of sensitivity to animals is also reflected in his lack of empathy to people. He described the 45 minute agonized death of an Oklahoma prisoner as 'an unfortunate mishap'.
. He voted against the trucker forced to TransAm to choose between freezing to death or risking his life and that of others by driving a trailer with frozen brakes.
. He said autistic children have a right only to the bare minimum of education. "As a lawyer at a Washington law firm in the early 2000s, Judge Gorsuch represented (billionaire) Mr. Anschutz, his companies and lower-ranking business executives as an outside counsel. In 2006, Mr. Anschutz successfully lobbied Colorado’s lone Republican senator and the Bush administration to nominate Judge Gorsuch to the federal appeals court. And since joining the court, Judge Gorsuch has been a semiregular speaker at the mogul’s annual dove-hunting retreats for the wealthy and politically prominent at his 60-square-mile Eagles Nest Ranch." Anschutz, Gorsuch and others are mutual owners of a hunting lodge in Cranby Colorado.